One of the joys of home-ownership is getting to replace stuff when it goes bad. 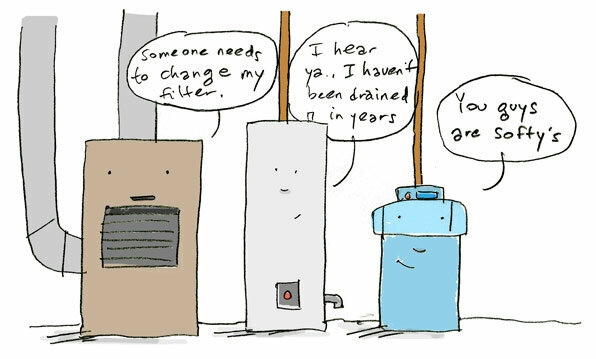 And, this past week, we were blessed when we found out we needed to replace our older water heater (can you tell I’m trying to have a good attitude about this?). Fortunately, we do have an emergency fund in place so these unexpected expenses don’t cause too much havoc on our finances. Having never replaced a water heater before – I quickly dug in to find out all I could about when water heaters need replacing and what are some of the signs you need to be aware of before it goes out on you. I also spoke with my plumber that I’ve grown to trust (who did the replacement) as well as a knowledgeable store associate at my local hardware/appliance store. I like getting all the information I can about a major purchase / repair before I do anything. Age of the water heater. Depending on the type of heater you have, these can go out anywhere from 6-12 years (sometimes less, depending on how hard the water is where you live). But generally, my plumber indicated that at the 10-year point, you may want to inspect your water heater or replace er. Leaks. One of the worst things that can happen and one of the most obvious indicators for a replacement would be the tank springs a leak. Hopefully you have a drain nearby and it doesn’t flood the whole basement (or wherever it may reside). Is not properly heating your water. 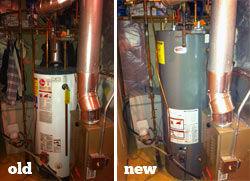 Age and improper heating was one of the first signs we knew it was time to replace ours. For several weeks now we haven’t been getting consistent heating during showers. Now, this also could be a sign that the bottom of the tank is full of gunk (or, residue from water). This stuff sits at the bottom of the tank and continues to build up until it impedes proper heating of your water. While you can try and drain your tank to get rid of the sediment, it will not always fix your problem – and could make things worse. According to our trusted plumber, if it is having this problem and your water heater is getting up there in age, replacing the tank could be a wise preventative measure. Note: no hot water could be related to the pilot light going out on your heater. Make sure you check that before replacing. Sounds. If you are hearing loud pops and cracks coming from the tank, this could be related to the heating elements going bad. Metallic water taste. Tasting your water – and you detect a metallic flavor, this could be a sign it is close to breaking-down. What type of heater to get? We chose to replace our old one with another gas tank. These guys are typically less expensive than tankless water heaters, but, unless it has an Energy Star sticker on it, you won’t qualify for government rebates that are still in effect (as of this writing – ending on December 31, 2013). Tankless heaters are supposed to be the next big thing in water heating – but have yet to prove themselves to be economical here in the States. They tend to be more expensive to purchase and more troublesome to install. The government does offer a substantial rebate on them if purchased – but it still isn’t enough to justify their cost. And, because the water coming out of the ground is quite cold in the northern states – tankless heaters (on-demand water heat) do not seem to heat up the water “hot” enough. What’s been your experience with water heaters? How did you save money when buying a new one? How Matthew and his wife save on their cell phones every month. We were redesigning our bathroom not so long ago and got rid of our traditional water heater. We bought tankless one and for now (2 years and counting) we can not be happier about that decision. We just went through this at my house. It happened unexpectedly and we noticed by the puddles we found in the basement. We found it soon enough so not to much damage. We replaced it with another gas tank like you did. Thanks for the input Anita on tankless heaters. It’s important to note how long you’ll need to own it to “recoup costs” – but at the same time, it will be lasting you longer. I suspect the price on these will come down in the future, making them more of an economical choice. After replacing 2 tank style water heaters in the span of 16 years (so an ave life of 8 yrs ea) we spent the money and bought a tankless heater last year which is estimated to last up to 20 years. We use propane at our house for heat, etc and noticed a difference in our usage immediately. Both the propane and our water usage went down because we’re not having to constantly heat 40 gallons of water. The tankless has worked flawlessly, we have not experienced any time of no hot water. We have figured we’ll recoupe our costs in approximate 10 years or so, which may seem like a long time but it beats having to replace water heaters every 8 years or so! After ten years, ours took a complete header, so to speak, and drained all over basement (unfinished luckily) on a particularly cold and bone-chilling October weekend. Couldn’t agree more with previous poster with replacing things on your own schedule. You can plan, and find the best deal, rather than being panicked and pressed. When you have to take cold showers two days in a row, you’ll be begging to pay the premium.